Day four was set to be another 25 miles so given how good the previous day had been I was confident I would be done by 6pm, especially as I wouldn’t be taking such a long lunch break. Even so, the alarm was set for 05:15am once again and I was out the door by 06:25am. The day did not get off to a good start however, as I’d washed virtually all my clothes the night before and none of them had even remotely dried, so I was now carrying a plastic bag full of wet, heavy clothes. Gareth had left some food so I smashed down some pasta for breakfast, took a double dose of nurofen and co-codamol and, unable to put much weight on my right leg at all, limped out the door and down the stairs with my pack on my shoulders. 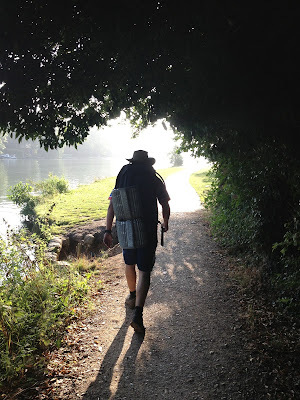 I had given myself 11.5 hours to do this walk because on my way down to Kemble the previous Saturday I had received a call from Cookham Campsite, where I planned to stay this evening, to advise me that they would be locking the site at 7pm. Now, at most campsites this just means the office is closing and you can usually still wander in, but it sounded like that wasn’t the case here so I needed to get a shift on. I began the day slowly once again as I waited for the painkillers to kick in, but walking through Mapledurham was seriously nice before hitting another A-road that would take me through Tilehurst. Here I was meeting my friend Ted, a Reading University Alumni, and it seemed appropriate that we’d move passed our old stomping ground together. I left Ted at Caversham Bridge (and offloaded a bag of wet clothes to him! ), which also marked the 100 mile spot, and the day continued to warm up as I pushed on towards Henley. It was another really nice moment…but I wasn’t allowed to hold into it for long as he then said it was more like 15 miles to Cookham rather than the 10 I thought it was, and I went from wanting to hug him to wanting to punch him in the face. After a very brief catch up with Jonty Clarke, another old Reading boy, I arrived at the Angel in Henley and after doing some more research and discovered that it was indeed five miles further than I thought to Cookham. This was a nightmare on many levels and plunged me into a serious trough. I was never going to make it there by 6pm, so I called the site and the chap there just said: “You can always camp at Marlow” – which is several miles closer and would have just made Thursday a longer day. Very nearly vommed seconds after this was taken...true story. My one stipulation at the start was to walk all the way and not get in a vehicle at any point, so this was something of a crisis point. I had a decision to make...and I did not hesitate, not for a second, to take that offer up. As my father always said, rules are for the obedience of fools and the guidance of wise men. I felt much better afterwards. Gareth had warned me that I might need to compromise at some point, even suggesting I take up the fact that I was due to finish on a Saturday so I could add an extra day if I needed. I knew I couldn’t do that, people had made plans to meet me for the final day and I couldn’t mess them around like that. This was a simple option, I’d still be walking every step and, as we got in the car that evening Mrs Ted made the excellent point that this way the second half of my trip would be that much happier – there wasn’t much point in being miserable just out of stubbornness. The afternoon was really good. Shortly after lunch I spent a good 40 minutes chatting to a random chap called Geoff who was out walking his dog and took a real interest in what I was doing and gave some pretty useful advice. Mrs Ted met me around 3:30pm and we pushed on through some really nice spots again. It gradually got darker and I started to feel pretty sick around Marlow and also got the 6pm shakes again. These had started on day one and had become a regular feature. It was quite odd, and had nothing to do with being cold, and it would happen bang on 6pm every single day. Most unusual. We reached Cookham and indeed the whole campsite was locked up, which in fact blocked the path altogether. We had a 20 minute wait while Ted went back for the Car and Mrs Ted decided to massage my shin splint, which I now thought was a muscle knot and goodness me did she make me scream. However, before she started I couldn’t even put weight on my right leg or wriggle my foot at all, but I felt infinitely better afterwards. I arrived at the house of Rob and Annie just before 9pm, which was a simply incredible piece of hospitality as they fed me, let me use their house like it was my own and also did all my laundry. It was another example of outstanding warmth and generosity from people I had never previously met. That night Mrs Ted dosed me up with Tamazepam which helped me get at least fours hours of sleep straight off ,which was amazing, but my internal thermostat was still all over the place so sleep was still patchy for much of the night.